Welcome to my Corner! I specialize in Dark Fiction reviews including Horror, Dark Fantasy, Splatterpunk, Horror of the 70's & 80's, and Graphic Novels. I also read and review classics, true crime, thrillers and audio books of all genres except Romance. A young doctor named Viktor comes to the ancient castle/asylum, Hrad Orlu, excited to test his new theories in psychology. Housed at this asylum, isolated atop a mountain, are the 6 most dangerous killers alive today. At the bottom of the mountain in the town proper, a police detective named Lukas is trying his best to solve a series of murders which the press attributes to the "leather apron killer." At the same time as these events, the Nazis are on the rise in Germany. Will Viktor's new theories pan out, and allow psychiatry to identify dangerous individuals in the future? Will Lukas find his killer? Will the Nazis put a stop to all of that before it has even properly begun? 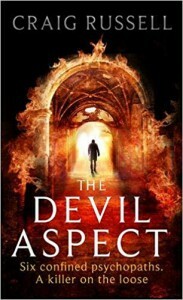 You'll have to read THE DEVIL ASPECT to find out! But, that didn't happen, because the voice of Craig Russell is more original than that. This tale twisted and turned until I had no clue what was going to happen! As more of Viktor's theories were tested, some things became clearer, while others became more perplexing. On top of all this, there was the rise of the Nazi party always in the background. Combined together, these components contributed to the overall feelings of anxiety and darkness that permeated this book. So why 4 stars and not 5? I felt the pacing dragged a bit during the middle portion of the story. Even though I was interested in all of the criminals Viktor was interviewing, I didn't feel that all of them were integral to the tale. It's a small thing, but at times I felt like I had been reading quite a lot without really getting anywhere. This is what I took away from THE DEVIL ASPECT: A NOVEL. Fun? Check! Hypnotizing scenes between the doctor and the criminals? Check! A Gothic castle, set atop a mountain surrounded by a dense forest, and creating a dark and gloomy atmosphere? Check! Twists and turns galore which put our heroes in jeopardy? Check! A denouement to beat the band? Hell yes! In short, (too late! ), I recommend this novel to fans of the above, but most especially to fans of Gothic fiction and psychological horror! I predict that this novel is going to knock some socks off! Share book reviews and ratings with Horror Aficionados , and even join a book club on Goodreads.